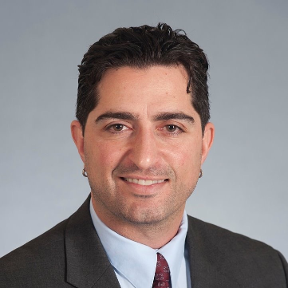 Great GIF's but it might be important to remember that of course it's simple - for those familiar, if not expert, in OnShape but not everyone is familiar, nor expert. The OS interface is different and unique and all of the tools may not be easy to find for a new user. Right now, I'm frustrated, embarrassed and angry and I'm gonna kick OS to touch for another month until the pain of trying to use this bloody interface subsides enough for me to try again. Thank you for your attempts to help me. Except, that isn't a properly proportion thread and it isn't cut to the right depth. Ie. 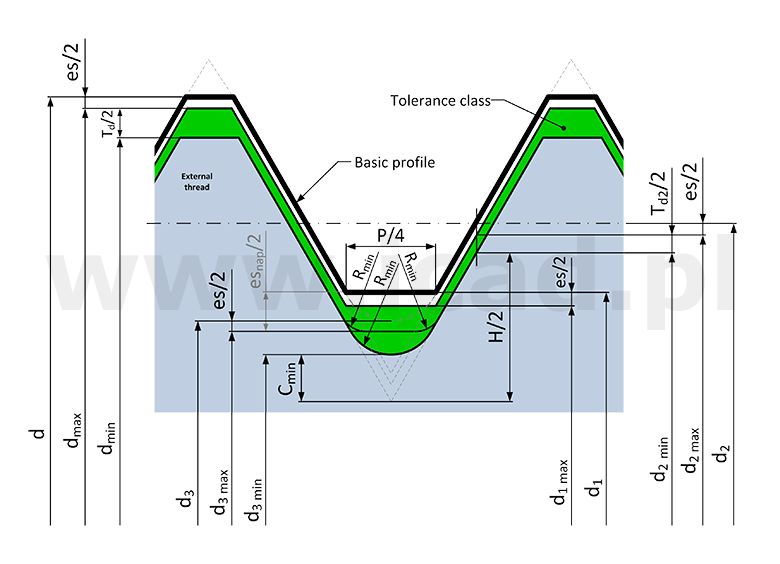 But drawing an accurately proportioned, positioned and toleranced thread so that it can subsequently be analysed with FEA for stress and strain, and produce realistic results accurate enough to base material specification upon; requires some attention to the details. 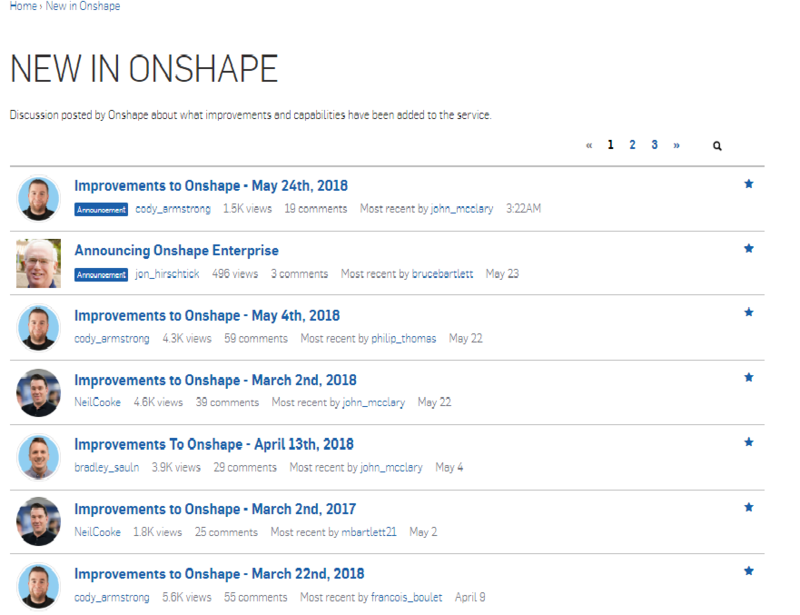 You do know that OnShape is designed to do exactly that - don't you? 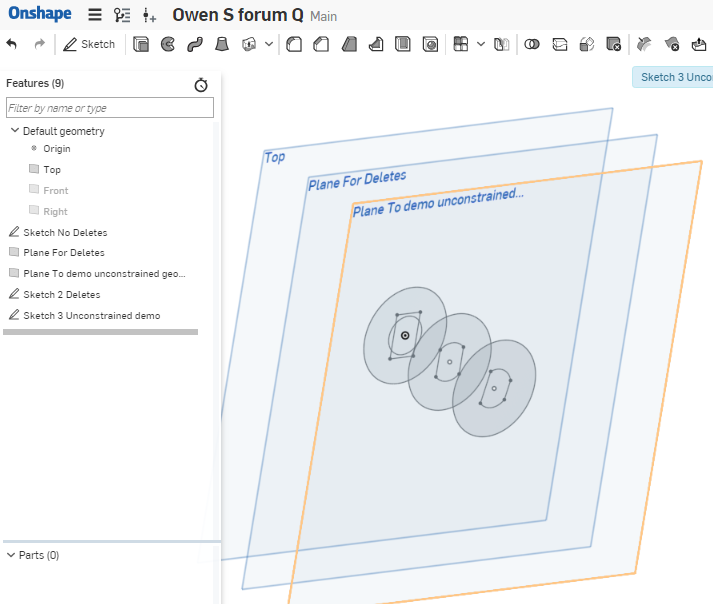 It may take some investment of time to learn the interface, just like any piece of software, but OnShape is more than capable of designing a nut and bolt thread to any exacting standard a user might require. 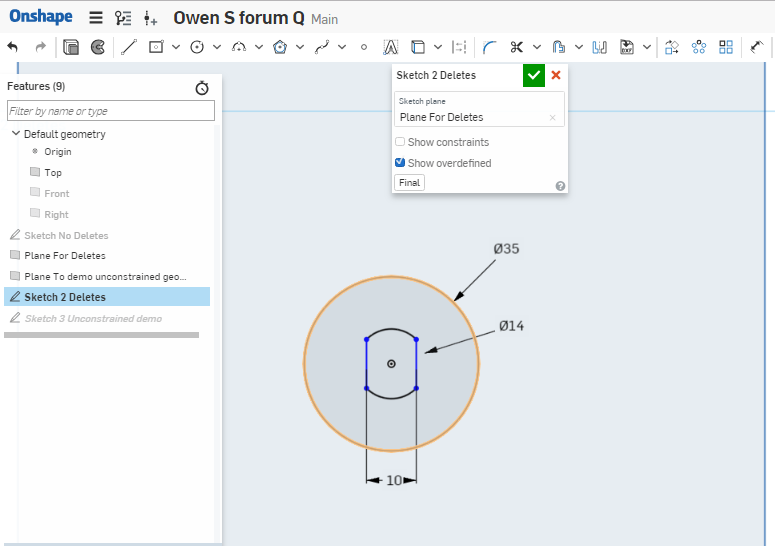 None of the previous answers, videos or GIF's were intended to create nuts and bolts to exacting standards but rather to show the basic steps within the OnShape interface. I have a suggestion, if you're truly looking to learn the OS interface, is tackle one simple challenge at a time and post a separate thread re: same. 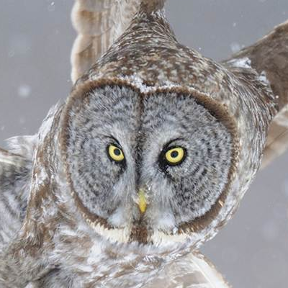 That might get you a little closer a little slower but the knowledge will be something you might actually be able to use for the future. All of those additional dimensions (be they constants, variables or driven by equations) can be added with a couple of extra clicks. At this point it feels like you're just activity looking for problems where none exist. So yes, it really is that simple, we know because we do it every day. All of those additional dimensions (be they constants, variables or driven by equations) can be added with a couple of extra clicks. You miss the point entirely (once again). The drawing isn't posted as an example of something I want OS to do for me; it is the engineering specification for a standardised https://en.wikipedia.org/wiki/Metric_thread. In contrast to your randomly sized equilateral triangle, with one corner knock off at some random depth with some random radius, and positioned at the wrong place relative to the nominal diameter of the shaft. At this point it feels like you're just activity looking for problems where none exist. Not looking for, encountering. And documenting here to my own embarrassment. Hm. Yet you appear to not be capable of reading a specification. You can add all that extra detail into into your sketch in a couple of minutes. Better still use configurations to build any size bolt you like automatically from a drop down list. Better still use featurescript to write a feature that will build it for you. Also let me add a final comment. Some of us have been here for years, some are new. All are respectful and helpful to each other. It's a great place to be. Never in all the time I've been posting here have I seen anything approaching this level of single minded arrogance. 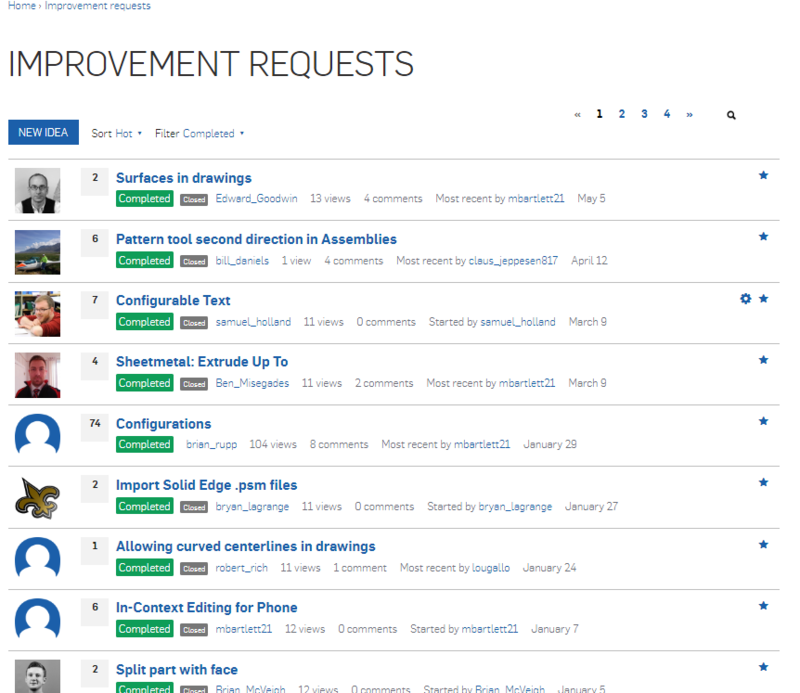 me_here:- Waah, Onshape is hard and can't do "a". Forum users (polite help):- Sorry you're having trouble here are 3 examples of how to do "a", have a nice day. me_here:- Waah, yeah but it can't do "b". Forum users (bending over backwards):- OK you didn't ask for "b" but here are some videos of how to do it in approximately 20 seconds. me_here:- Waah, why are you so stupid that you answered the question I asked rather than determining that I wanted to build a thread to the standard? Bearing this in mind i have no interest in communication with you in the future. 1) draw a proper thread. 2) position anything accurately in this ... system. But damn was it ever a faff, frought with weirdness and duplicated effort. Probably, but the knowledge of how seems thin on the ground. I'm amazed after this long thread nobody has stepped up to demonstrate how. c) and how many times more effort it is to do so than in those other environments. I don't need to be liked by a bunch of strangers; I needed to know if this product had a knowledgable and helpful community, and you've given me my answer. Nor I you. You been patronising me from your first reply, and get offended when I call you out. You can find it in "Manage account"
And documenting here to my own embarrassment. And, what do you imagine is wrong with that? Further proof that despite your self proclaimed expertise, you do not know how to read a specification. In an external (male) thread (e.g., on a bolt), the major diameter Dmaj and the minor diameter Dmin define maximum dimensions of the thread. 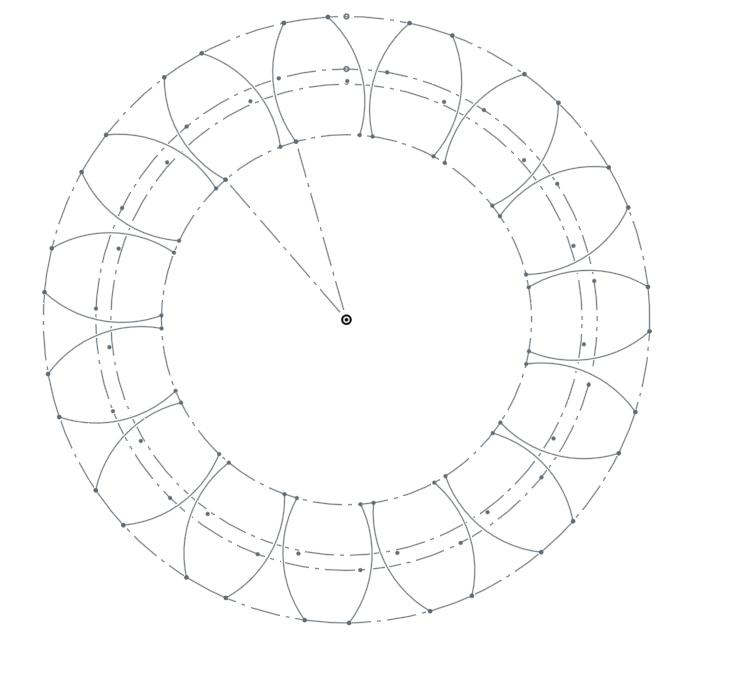 This means that the external thread must end flat at Dmaj, but can be rounded out below the minor diameter Dmin. Conversely, in an internal (female) thread (e.g., in a nut), the major and minor diameters are minimum dimensions; therefore the thread profile must end flat at Dmin but may be rounded out beyond Dmaj. But note also that Rmin is shown in 2 (and by implication of symmetry, 3) different places. Using a conic section, a variety of different compliant radii can be approximated -- within an acceptable few percentage points -- by varying a single parameter. Which facilitates this type(pdf) of simulation testing relatively painlessly. So your answer to people who ask questions you apparently cannot answer, is to suggest they cancel their account and fornicate away. Great community support. That could be fixed, but it will only happen if the problems can be openly discussed and addressed. 2) A poor help system that seems to be based on the 'Never mind the quality feel the width' philosophy. Less is more when it comes to documentation; and segregating marketing hype from help & support. goes a long way to producing a concise and accurate learning path for new users; and reference for those who've forgotten the details. 3) .A user community that doesn't take critical evaluation as a personal affront; and resort to 'It's my ball...', when their slipshod advice is questioned. Which is a crying shame; because the single greatest asset a software product can have, is a strong, open user community that recognises the flaws as well as the good stuff in the product. That's how good products become great ones. 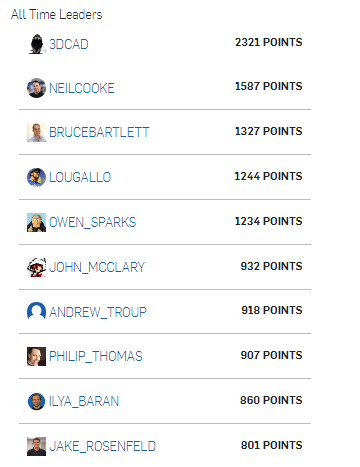 (4) A forum packed full of Onshape staff, Professional Engineers, Makers, Hobbyists you name it, all of whom have shown over and over again that they're ready to help anyone who has a question. (5) In my opinion some of the most clean consistent and intuitive interfaces I've used. That's not to say they can't be improved. OS are always developing and happy to engage in feedback discussion. So if you're new here please don't be put off by this one thread. This is very much a one off. 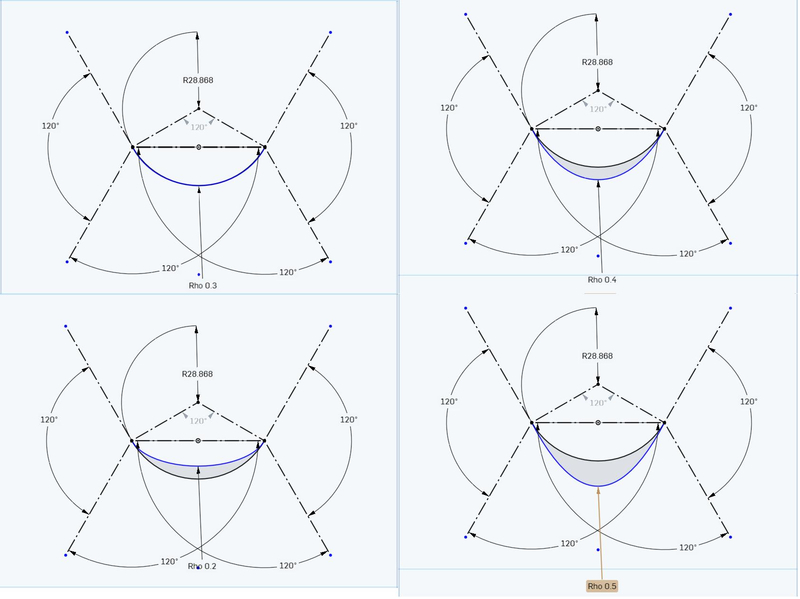 Bottom left: same conic simulating a larger radius. Top & bottom right: Same conic simulating smaller radii. Thank you, I now understand conics. Surely the nominal shape of a thread cutting tool is round, no? My original surprise was not the conic, it was that your sketches had no dimensions. This is bad. Surely the nominal shape of a thread cutting tool is round, no? Actually not. In the original standard (1957 I think) for M threads, the standard only specified the upper maximum of the minor diameters (root diameters) of internal and external threads; and it was noted that "they may/can be radiused". It wasn't until the 1998 revision that a minimum root radius was specified, but even that doesn't fix the root as round. 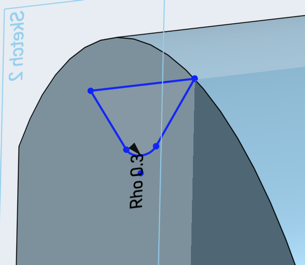 Within the margins between the upper and lower tolerances, the shape is unspecified, so a variety of root profiles -- from from flat with radiused corners to oval to fully round -- are possible. The green tolerance area and multiple Rmin radii in this diagram make it clear(er). Excuses: 1) It's a junk project for trying things out; 2) I'm (as is obvious) still getting to grips with the interface here. In general, I prefer to not clutter my models with dimensioning; I leave that to the drawings. OK, now I understand why you no understand, perhaps "delete account" was bad. I am sorry. 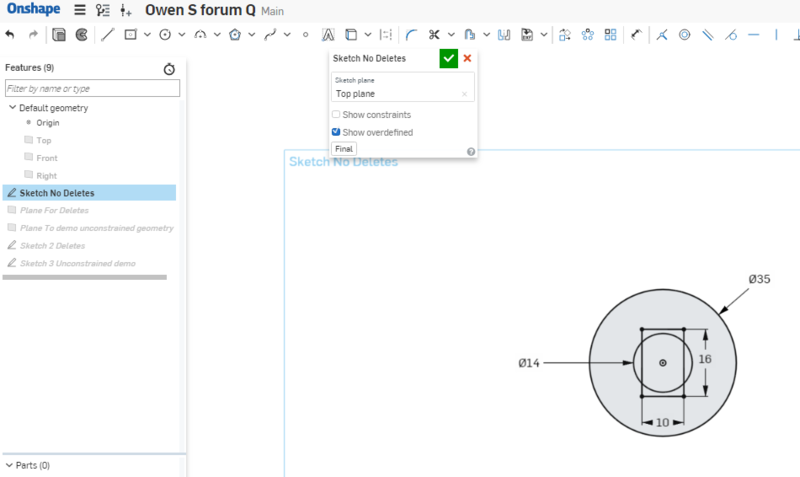 You must NOT use OnShape like AutoCad or Catia v4 they are both explicit geometry systems. 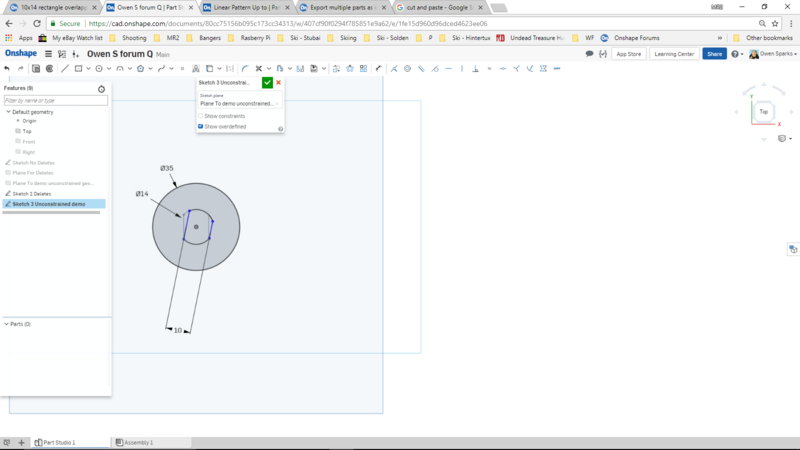 OnShape (and Solidworks, Catia v5 etc.) are parametric and MUST have all dimensions and constraints to make black geometry. If you do not do this, lines may move and your model is wrong. Sketches must be "solved" by using dimensions and constraints. When all is black, sketch has only one solution. If you edit #D (diameter) and #P (pitch) thread should be correct for all possible sizes. 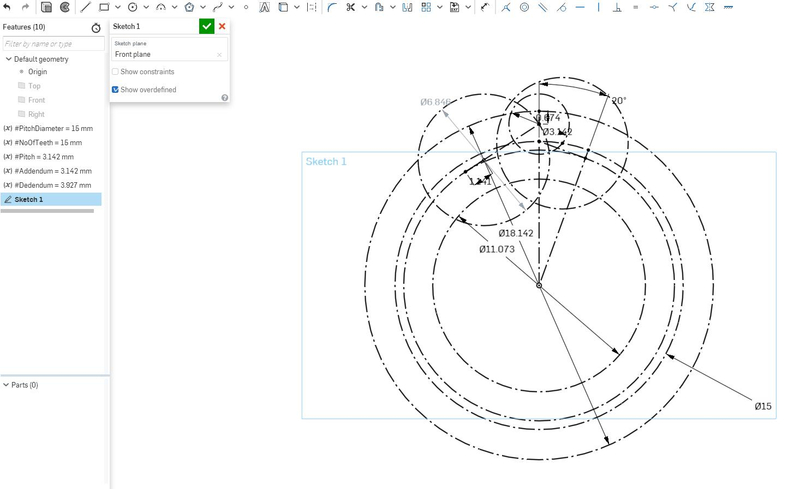 This is why people use OnShape not AutoCad. Sorry, I used a full round. OK, now I understand why you no understand, perhaps "delete account" was bad. I am sorry. No worries. Thank you for persisting. 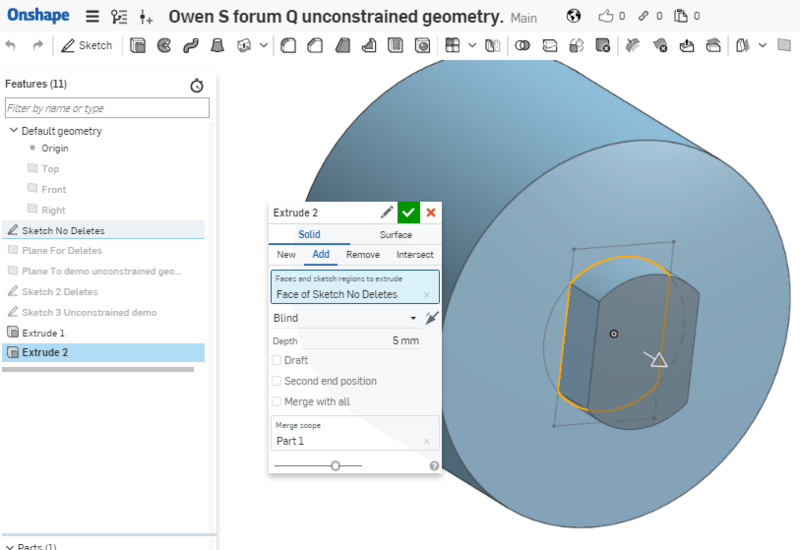 You must NOT use OnShape like AutoCad or Catia v4 they are both explicit geometry systems. OnShape (and Solidworks, Catia v5 etc.) are parametric and MUST have all dimensions and constraints to make black geometry. If you do not do this, lines may move and your model is wrong. This is where OS is leaving me cold at the moment. It seems to want/need me to "dimension" and constrain, lines and curves that it already know the values for; or should be able to infer. Two concentric circles (14mm & 35mm) centred at the origin; and a centre point rectangle 10mm x 16mm also centred about the origin. I then trimmed away the bits I don't want. As far as I'm concerned -- and other software I have concurs -- that sketch is entirely defined; yet OS marks the two verticals in blue indicating (I assume) that it doesn't think that they are yet fully defined. The worst part is that I cannot find (or perhaps; do not recognise?) anything that tells me why it isn't happy; or what it wants me to do to satisfy it. To the best of my memory, I haven't "shouted" at anyone. It was never about constructing the exact geometry for a thread profile. The only complaint I made, is that examples of "how easy it is in OS"; only make it look easy because they were ignoring 90% of the requirements. 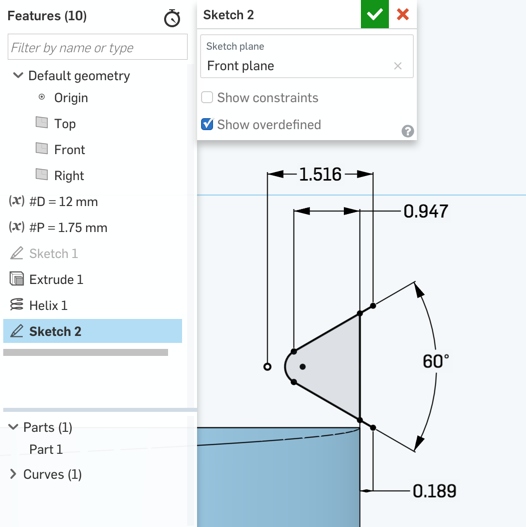 Sketches must be "solved" by using dimensions and constraints. When all is black, sketch has only one solution. If you edit #D (diameter) and #P (pitch) thread should be correct for all possible sizes. The point I've labelled "A", defines the relative position of the sketch to the shaft, in the horizontal axis, but I do not see anything that defines its vertical relationship to the shaft/helix? 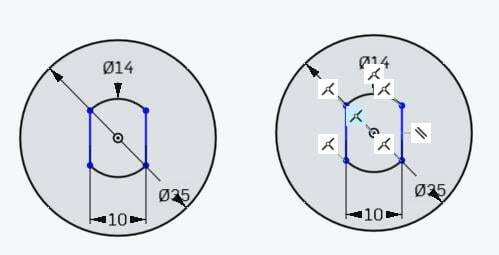 I can see that sketch2 is named as the face to sweep in Sweep2, but I'm baffled by how the relative position is defined or constrained to the helix? Also, what do you do if you want to reuse that same profile on a shaft that is oriented in a different axis? 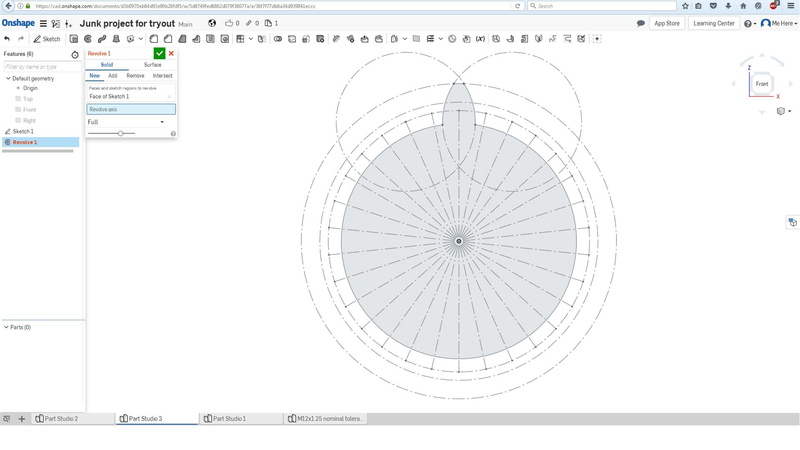 This is why people use OnShape not AutoCad. It does help; though it still raises almost as many questions as it answers. I get the difference between parametric and direct modelling -- its why I am continuing to persevere with OS. The bit that is still bugging me, is why is it consider 'better' to do away with the grid and snaps? There is no conflict I am aware of between their use and parametric models. Why is it better to draw 4 randomly length lines at random orientations and relative positions, and then apply a bunch of dimensions, equal constraints, parallel constraints, et.al; than to draw a square of the size and position I want with two clicks? Right, I'll admit it felt pretty good to lash out against what I thought was an injustice yesterday; well for about an hour anyway. After that it just felt stupid to make enemies. It wasn't big, it wasn't clever so I apologise and offer up an explanation of the behaviour you're seeing below as a peace offering. Do with it what you will. You did indeed have a fully constrained sketch. The operative word being "did". As soon as you chopped away some of the geometry you chopped away what the remaining geometry was constrained to. The easy way to tell which constraint is missing is to grab one of the blue points and try to move it around. This will show what degrees of freedom it has. In this case you can see you're free to drag them around what was the circle, so all 4 of those points are unconstrained. Don't worry about messing up the sketch by dragging stuff, a single undo sets it all back into place. There are a couple of ways of fixing this. (3) Don't delete them at all. 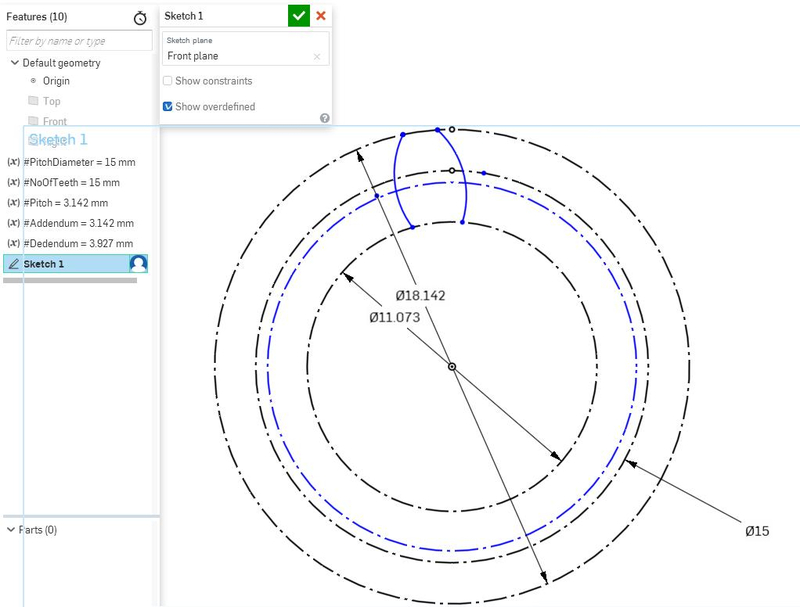 We see folks from other CAD systems want to "tidy up" their sketches all the time. Sounds sensible good practice but is unnecessary and just adds more work. There is nothing you can do with the chopped down sketch that you couldn't do with the original one. This is because OS sees sketch "regions" so we don't have to say extrude the entire sketch, we can pick which regions we want to extrude and make one solid part from multiple regions. Hope some of that is of interest. And that has yet to have its fillet radii added, and has to be replicated 15 times around the gear. (Im having difficulty picking out the relevant parts of the construction. Isn't a huge improvement in clarity, it does at least allow me to see that I made a mistake in my construction somewhere, which leaves my tooth lopsided. As for how to satisfy the solvers demands, I haven't (and am not given as far as I can discover) a clue as to what it wants. (And yes, I'm aware that making the #NoOfTeeth variable a length does not make a whole lot of sense; but it was the only way I could find that would allow me to specify #Pitch in terms of #PitchDiameter/#NoOfTeeth and not get "Enter a valid expression". again I've no idea and can find nothing to assist me. ^Z doesn't do anything that I can detect. OK a few things going on there. Easy one first, no need to pattern all those teeth in the sketch for each tooth. Much easier for your modeling sanity and for the software regen times to model one tooth, make that into a solid and then pattern solid, either by faces or feature. For the clarity of the initial sketch I'd work like this. The construction lines won't form a region (that's the intention) so for a a single tooth I'd build it with construction geometry, then split those lines at their intersection points, then convert just the required line segments from construction to normal geometry. 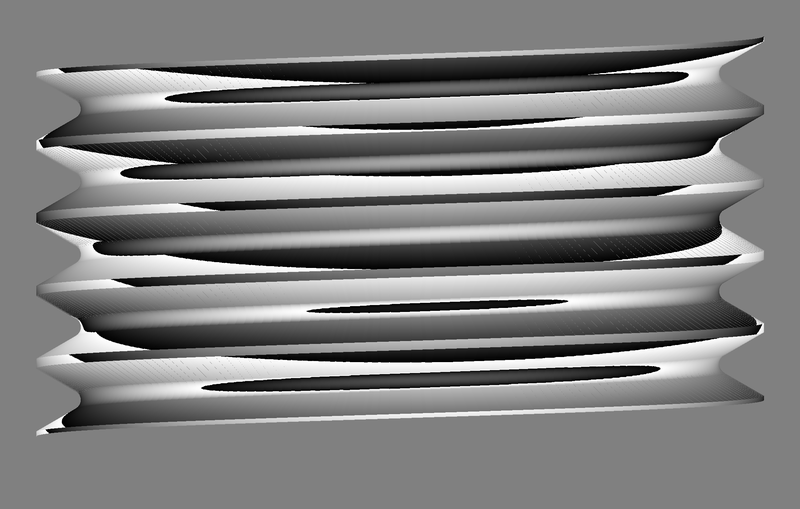 You'll then not have real lines overlapping construction lines, it'll still be parametric, and the solid lines will automatically form a region which will tun solid grey, so easy to visualise. Assuming the fillets are a final part of geomety, ie nothing references off them then I'd consider putting the fillets on the solid for clarity too. As for the solvers "demands" it seems pretty robust. If it's blue it's pretty sure it's not constrained, so as I mentioned above just click on a point and try and drag it around, you'll soon see what it is or isn't constrained too. It becomes a lot easier after a short while. BTW there are a bunch of existing gear generation files, and a few featurescripts knocking about so there might be a some public files to draw from. 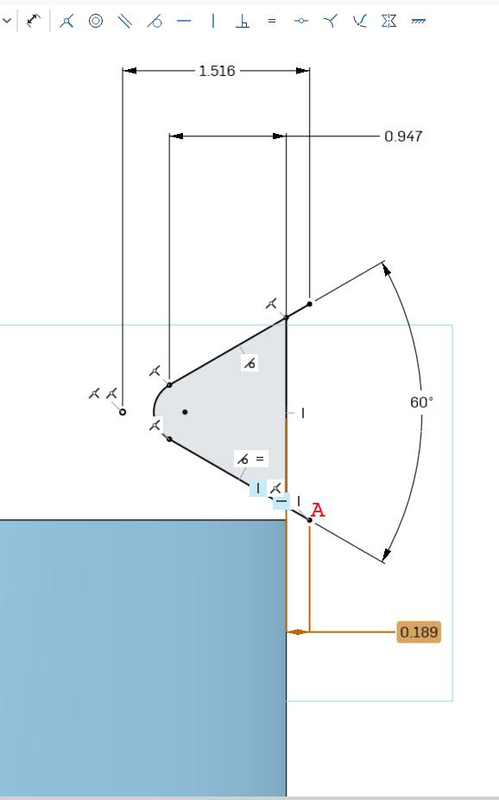 I want to revolve this surface; the revolve tool wants me to select the axis or rotation -- in this case, the origin; but it is impossible to do. It offers me the opportunity to select every construction line on the planet, despite that all of them would involve revolving the surface out of it plane; but not the one entity that would revolve it in-plane. Any other CAD would allow me to select the origin in the structure tree on the left; no so OS. You answer will be well don't rotate that, make it a solid and then rotate the solid; but this isn't about this diagram, or gears specifically, its about OS making the basic laborious and difficult and mysterious and frustrating. And its about OS imposing a set of arbitrary restrictions -- no grids; no (useful) snap points; no way to hide construction lines without deleting them. The list grows longer as my ambitions (small as they are) grow. 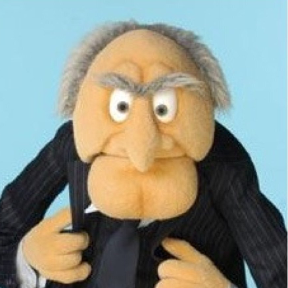 Your apology was premature Paulo, I am taking your advice. Life is just too short. As the saying goes "everybody brings joy to a room, some by arriving..."